The texts given extended consideration include Robert Ballantyne’s The Coral Island (1858), Robert Louis Stevenson’s Treasure Island (1883), “The Beach of Falesá” (1892), and The Ebb-Tide (1894), Rudyard Kipling’s The Man Who Would Be King (1888), The Light That Failed (1891), and Captains Courageous (1897), Erskine Childers’ The Riddle of the Sands (1903), H. Rider Haggard’s King Solomon’s Mines (1885), She (1887), and Allan Quatermain (1887), Olive Schreiner’s Trooper Peter Halket of Mashonaland (1897), A. E. W. Mason’s The Four Feathers (1902), W. H. Hudson’s Green Mansions (1904), John Buchan’s Prester John (1910), and The Thirty-Nine Steps (1915), Anthony Hope’s The Prisoner of Zenda (1894), and Henry de Vere Stacpoole’s The Blue Lagoon (1908). Given the title of Kestner’s book, one may feel that in spite of the not unimportant generic differences between these works, none of them is too obviously out of place. But Kestner also devotes significant attention to a number of Conradian texts, including “An Outpost of Progress,” “Youth,” "Heart of Darkness," Typhoon, “The Secret Sharer,” “A Smile of Fortune,” “The Planter of Malata,” and The Shadow-Line. This inevitably raises the question as to whether some or all of Conrad’s texts are included as counter-examples, critiques of “adventure fiction” that adopt certain of the sub-genre’s conventions only to undermine or subvert it or them, or whether Conrad is seen as yet another writer of adventure fiction along with those other authors listed above. The choice of that opening quotation from Lord Jim would suggest that Kestner is interested in Conrad as a dissident voice, a writer prepared to display the conventions of adventure fiction (especially those connection with the formation of masculinity) only to undercut them and to expose their inadequacies (along with their disastrous effects in the real world on their readers). In his introduction, Kestner cites Martin Green’s contention that by the 1880s the temperament of England was hostile to the adventure tale (2) and notes that “By the time Conrad writes his tales, there is clearly a subversion of the adventure genre” (4). Moreover in the course of establishing what an adventure novel is, Kestner cites Linda Dryden’s claims that the focus of adventure fiction is “on heroes anxious for thrilling adventures where they prove their manliness, assert English racial superiority, and plunder the land of its riches,” and that “Conrad’s fiction challenges notions of confident Empire and the assumption of white superiority” (7, quoting Dryden). All this would suggest that Conrad’s texts are included as counter-examples, as fictions that critique the assumptions and conventions of the adventure story proper. But at the start of his first main chapter, Kestner explains that the texts examined in the book, “concentrate on the masculinities of their protagonists and the formation of masculine identity through adventure fiction” (27), a comment that does not seek to distinguish Conrad from the other writers discussed. 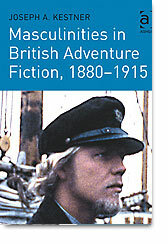 On the following page, in the course of a discussion of John Peck’s book Maritime Fiction: Sailors and the Sea in British and American Novels, 1719–1917 (2001), the association is made explicit: “In all cases, these texts by Stevenson, Kipling, Childers and Conrad show adventure writers using the genre to analyse rites of passage for their protagonists” (28). If the categorisation of Conrad as an adventure writer is Peck’s rather than Kestner’s, the latter does not distance himself from it. The favourable critics of that story, Q amongst others remarked with a sort of surprise “This after all is a story for boys yet – – – – –” Exactly. Out of the material of a boys’ story I’ve made Youth by the force of the idea expressed in accordance with a strict conception of my method (Collected Letters 2: 417). The key word here, surely, is “yet,” which opens up a qualification that allows Conrad to distinguish between “the material of a boys’ story” and what he makes of this material. But if this would seem finally to have settled matters, in the third chapter of the book and in the context of a discussion of "Heart of Darkness," Kestner argues that “Influenced by the adventure narratives of Haggard and Stevenson, Conrad deploys the adventure genre to include not only explorations of territory but also explorations of the self” (105), as if this were a new use of the genre rather than something that, as the earlier quotation puts it, is “the intention of much adventure fiction.” Moreover, in this same discussion Kestner claims that Conrad’s novella “illustrates the validity of Lee Horsley’s ideas about Conrad and the adventure genre” (106). These ideas he then presents by means of an extended quotation from Horsley, which opens with Horsley’s noting that “Conrad’s novels are often included in studies of adventure tales because his rewritings of adventure motifs, though they are in many respects sardonic reversals of the genre, are at the same time powerful expression of the virtue inherent in heroic assertion.” The quotation from Horsley goes on to note that Conrad’s “narratives of loss and ironic disillusionment depart from popular versions of the adventure form,” especially with regard to the replacement of physical trials by moral and psychological ones (106, quoting Horsley). Here, one would have thought, was an ideal opportunity to discuss the placing of Conrad’s fiction in the light of Horsley’s argument, and to discuss the extent to which the “adventure genre” does or does not involve the exploration of the main protagonist’s inner self, but the opportunity is not taken. Now there may be an interesting case to make that in trying to subvert the adventure story a writer can easily become its prisoner. Kestner seems to come close to such a view in the course of a discussion of what he presents as Edward Said’s argument that “Adventure fiction is especially important as part of the ‘ideological formations’ which sustain imperialism and colonialism” (99). Kestner comments: “When a text such as Heart of Darkness or Trooper Peter Halket of Masonaland critiques such ideology, it becomes part of that ideological discourse” (99). But this comment again remains undeveloped; for most of the book the chosen Conrad texts are treated as if they belong unproblematically to the sub-genre of adventure fiction. I have so far concentrated on Kestner’s problematic and inconsistent assimilation of Conrad into the sub-genre of the adventure novel partly because it is an issue that is likely to be of particular interest to readers of the present review, but partly too because it is symptomatic of a certain fuzziness when it comes to the book’s driving arguments. Kestner’s discussions of individual texts are often interesting and rewarding, but it is often hard to fit these discussions into a clearly unfolding argument – whether about adventure fiction or the formation of masculinities. Kestner references secondary material very extensively: his bibliography is 26 pages long. But it is not always easy to establish how he locates himself in relation to the arguments of those whose work he cites. In English the word “adventurer” is more than a simple extension of the word “adventure.” The OED makes it clear that each word is complex and is possessed of varied and sometimes contradictory potential meanings. With both words the sense of chance or accident is always there, but “adventure” can have an exclusively positive force, as in the OED’s “an exciting or remarkable incident befalling anyone.” “Adventurer” is a more problematic term; the OED includes definitions such as “One who engages in warlike activity, attaching himself to no party; a soldier of fortune”; “a speculator”; “One who is on the look-out for personal advancement; one who lives by his wits.” There is no doubt that Conrad himself was well aware of these shades of often contradictory meaning. Little of this sense of Conrad’s awareness and exploration of the semantic complexities of these words comes over in Kestner’s account. Indeed, a phrase such as “the tradition of adventure literature” (38) obscures significant distinctions between writers other than Conrad whose texts are discussed in this book. On the book’s opening pages Kestner quotes a passage from Haggard’s Allan Quatermain that makes reference to “those grand-hearted old adventurers who have made England what she is” and who “will be remembered and taught with love and pride to little children” (1–2, quoting Haggard). Kestner comments: “Being an adventurer is part of being English in the final decades of Victoria’s reign” (2). The adventurers who began that struggle [the European conquest of the Malay Archipelago, JH] have left no descendants. The ideas of the world changed too quickly for that. But even far into the present century they have had successors. Almost in our own day we have seen one of them – a true adventurer in his devotion to his impulse – a man of high mind and of pure heart, lay the foundation of a flourishing state on the ideas of pity and justice. He recognized chivalrously the claims of the conquered; he was a disinterested adventurer, and the reward of his noble instincts is in the veneration with which a strange and faithful race cherish his memory. If Tasman and Sir James Brooke (who is surely the unnamed “man of high mind and pure heart” in this passage) are both adventurers, then the elasticities of the word need closer investigation than Kestner grants them. Such closeness of analysis is not, alas, to be found in the book under review. Thus while the reader who opens this book for a consideration of individual texts is likely to find much of value in the specific discussions, the reader who attempts to follow a consistent argument through the book about adventure literature or the formation of masculinity is likely to find the attempt frustrating. In conclusion, a small comment about a single interpretive detail. Discussing Conrad’s Typhoon, Kestner argues that Conrad’s captain is himself “fatally ambiguous: MacWhirr, as we have learned from an earlier narrative recollection, is not British but Irish.” Well, at the time at and about which Conrad was writing, although the foundation of the Irish Free State lay in the future, many Catholics from MacWhirr’s home town of Belfast would indeed have insisted that they were Irish and not British. But the name Tom MacWhirr, along with the fact that the captain has a daughter named Lydia, make it well-nigh certain that he is of Protestant stock. (It is not hard to imagine that the man who says “Facing it – always facing it – that’s the way to get through” would also be capable of saying “No surrender!”) Today as much as in Conrad’s time, only the very fleet of foot should venture to suggest to such a person that they are not British.